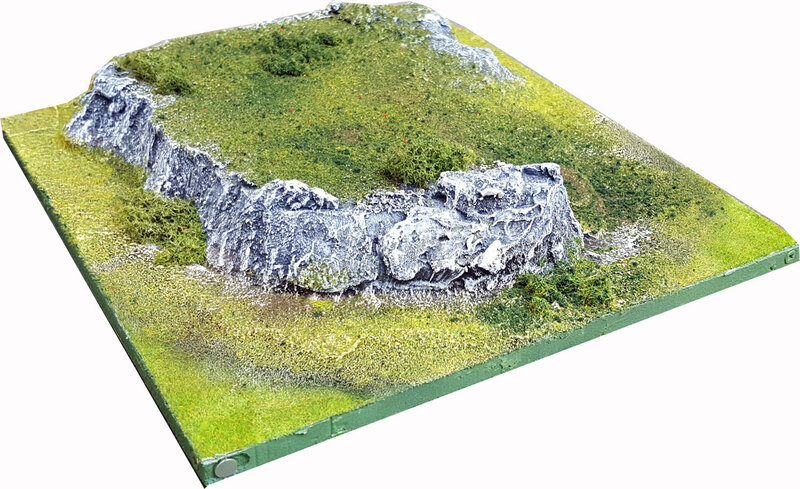 Enhance your terrain set with extra Hill tiles. Each Tile is 30cm x 30cm (1' x 1') and 1cm deep; the majority are made from polystyrene and PVC, with Resin extra pieces. There are three (3) discreet Hill tile designs: A full tile hill with an extra level piece (#1), a 4/5 tile hill with an extra hill piece (#2), and a 3/4 tile hill without extra levels (#3). The three main hills are designed so that they can be fitted side-by-side, creating longer hill pieces, or they can be placed alone in different places across the battlefield. The hilltops include metal hardpoints. These can be used for the second-level pieces to snap onto, or for other magnetic terrain pieces from Pedion tiles, such as trees, walls etc. The hills include both steep and gentle sides. Thus the players can declare sides which are unapproachable, pose a penalty to climb or have no effect on movement. As with all other Pedion tiles, the hills are actually part of the tile, rising seamlessly from the surrounding ground. However, keeping up with my modularity requirements, the hills consist of two pieces: the main hill tile, where the first elevation level rises, and a second, smaller "hill", which represents a second elevation level, that can be placed over the first one. So the players can either place a 2-level hill or two 1-level hills on their battlefield. Each hill elevation rise is about 3cm (1.18"). More details and photos of hills on their development blog page.